Sometimes a PDF just isn’t good enough when you want to protect your presentation (see Convert PowerPoint to PDF). For example, your client insists that you send your presentation as a native PowerPoint file so that they can go through it slide by slide in Presentation Mode on their computer. How do you do this while making sure that the content of your presentation isn’t easily edited or copy/pasted? 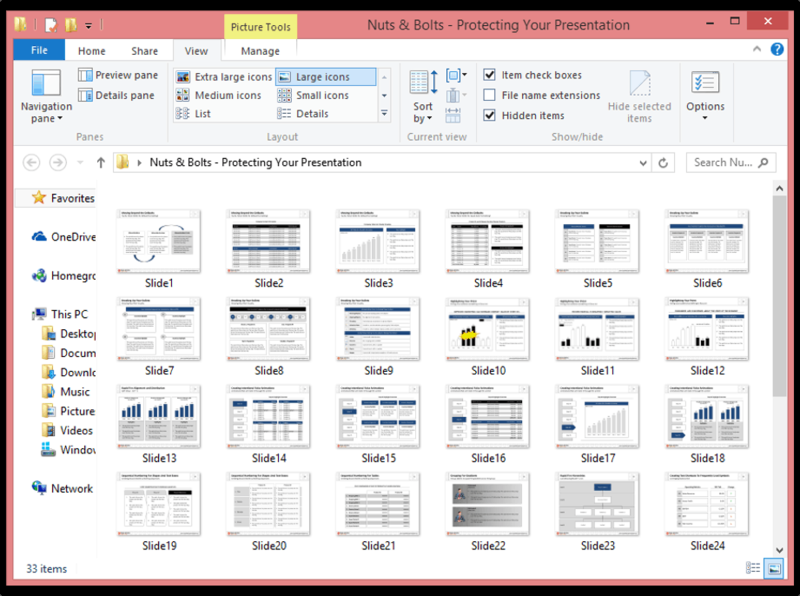 The fastest and least complicated way to protect your presentation is to turn all of your slides into pictures. The advantage of the first method is speed, the advantage of the second method is file size. The fastest way to pull this off is to save your presentation directly as a PowerPoint Picture Presentation…and you’re done! Notice that the file size for the longer method is almost half the file size of the faster method (based on a deck of 31 slides). As such, it you are emailing a larger deck, the longer method is definitely the way to go. Below are the tutorials for both methods depending on whether you are looking for speed or file size. 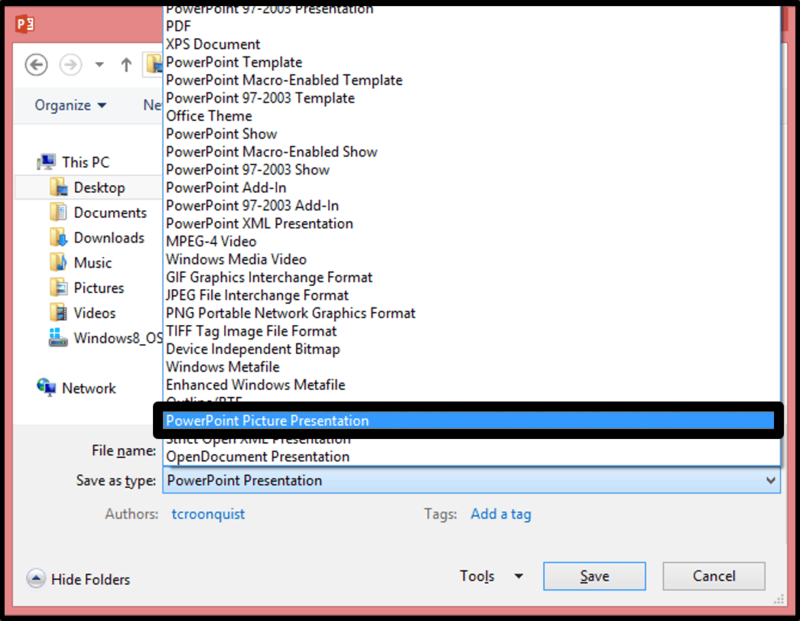 You can also protect your presentation with a password in the Read Only Mode, see how to password protect PowerPoint. For more details, see the step-by-step below. Within your PowerPoint presentation, hit F12 on your keyboard, to open the ‘Save As’ dialog box and select a location on your computer to save your presentation (I’ve selected the desktop below). 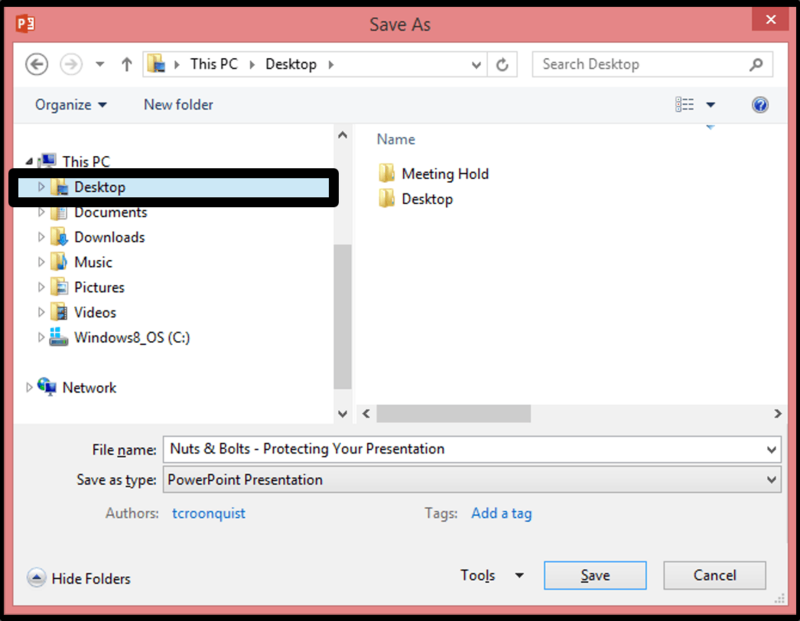 Rename your PowerPoint presentation, click ‘Save’ and PowerPoint will go to work. When it’s done, you’ll get a message confirming that presentation has been saved to the location you selected. Opening up your saved file and selecting a slide, you can see that the Picture Tools Format Tab opens. So all of the slides within your presentation are now pictures, where the content can’t be touched. Although this method is not as fast as the previous method, it is not only sneakier (which proves what you can accomplish by thinking outside of the box) but it leaves you with a smaller file size that you can more easily send via email. 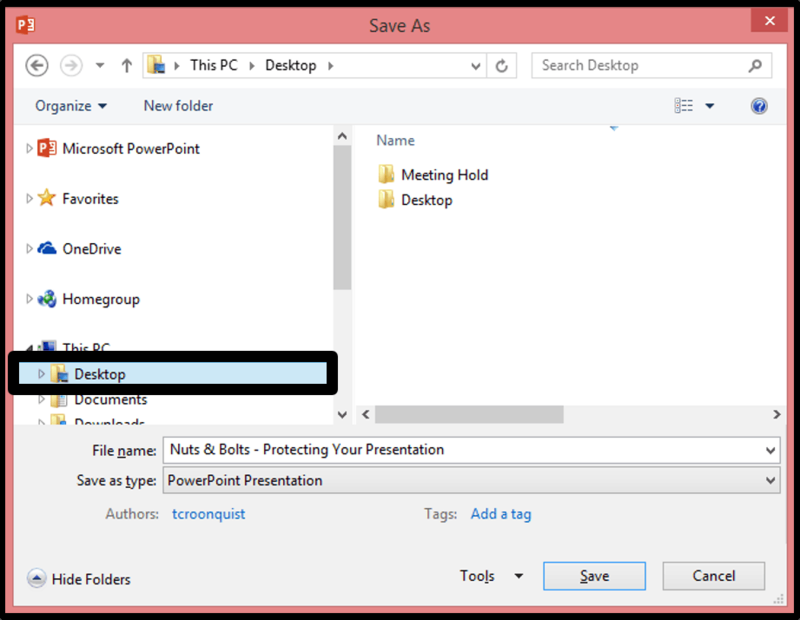 Within your PowerPoint presentation, hit F12 on your keyboard to launch the ‘Save As’ dialog box. Select a location that you will remember so that you can later retrieve the pictures (which we will do in the next step). I typically choose my desktop. With a location selected, use the “Save as type” drop down and select a picture file format to save your slides in. I typically choose the PNG file format but JPEG work too. Once you’ve picked your picture file format, select ‘Save’, which presents you with a dialog box. Select ‘All Slides’ on the left. 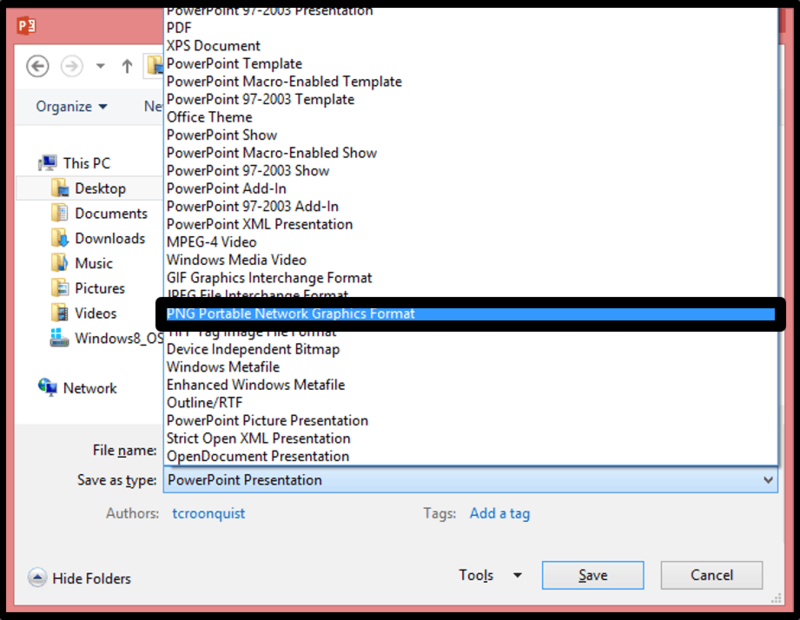 PowerPoint will take a moment to export all your slides as pictures, and create a folder in the file location you chose in step #1. Once it’s done, you will get a second dialog box, select ‘Okay’. If you now navigate to the location you exported the slides as pictures to, you should have a folder named after your presentation, with each of your slides saved within it as a picture, named Slide 1 through however many slides you had in your presentation. 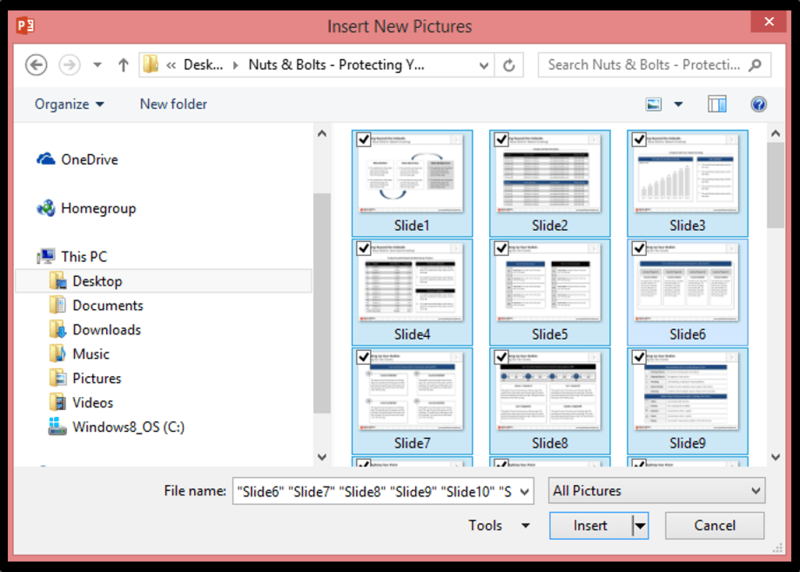 Back in your PowerPoint presentation, navigate to the ‘Insert Tab’ and select the ‘Photo Album’ command to launch the photo album dialog box. 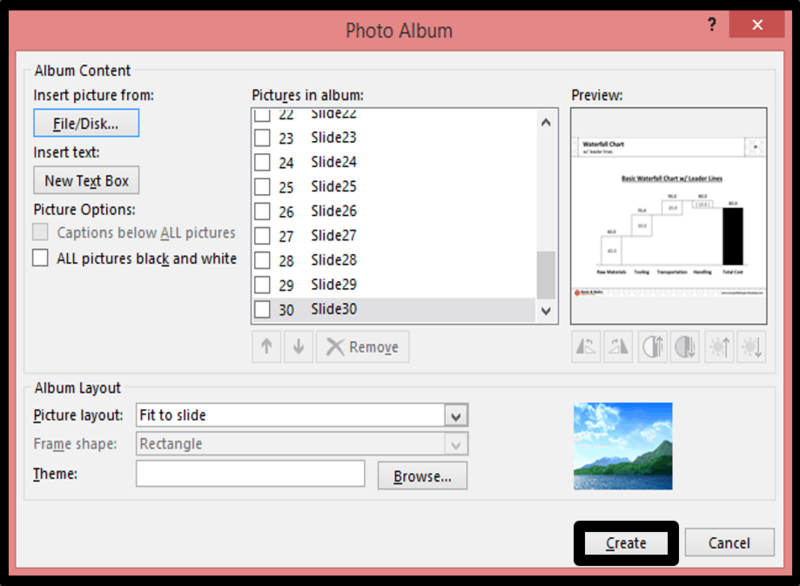 Within the Photo Album dialog box, use the File/Disk command on the left to navigate to where you exported the pictures of your slides to. Once you navigate to where the pictures are saved, select all of the pictures within the folder. You can quickly do this by selecting one of the pictures and hitting CTRL + A on your keyboard for Select All. 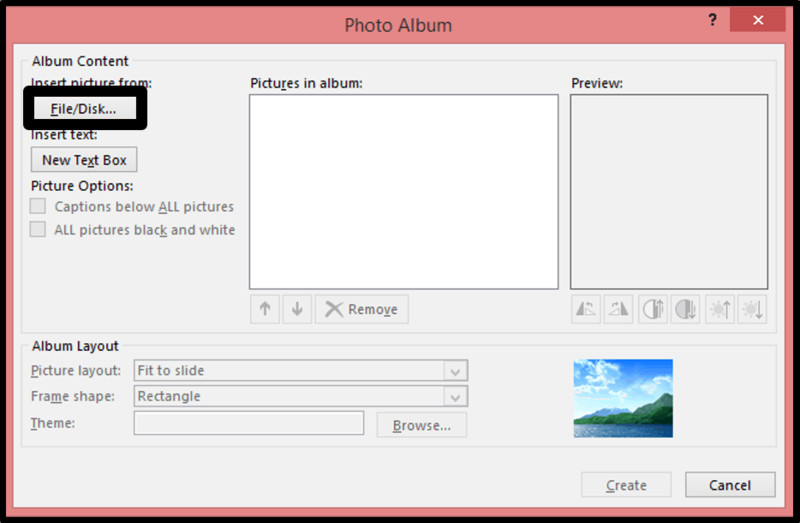 Once all of the pictures load into the Photo Album dialog box (notice they are all in the correct sequence) select ‘Create’. 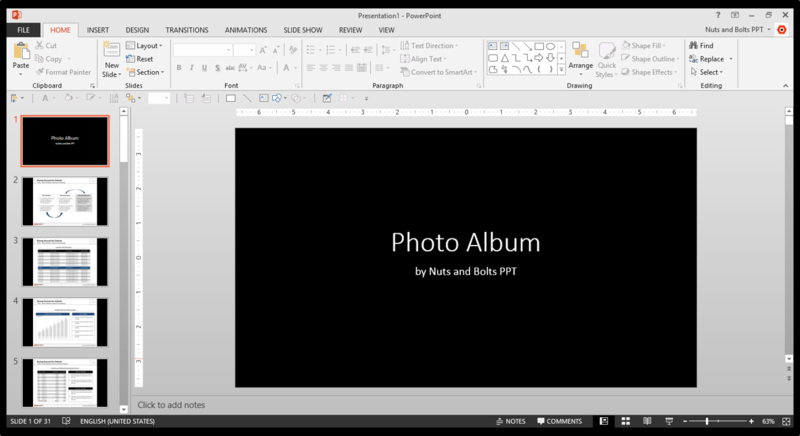 Now that your new PowerPoint presentation is created, it has a title slide that says “Photo Album”. Presumably, you don’t want this slide in your presentation, so select it and hit Delete. 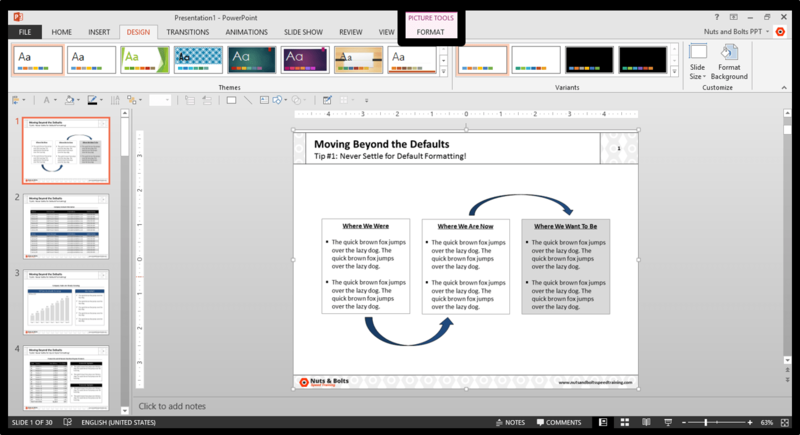 If you are using PowerPoint 2013 and you don’t want the widescreen dimensions, navigate to the Design Tab in the ribbon, and select the ‘Slide Size’ command on the far right. Within the drop down, select ‘Standard (4:3)’. You are now presented with a dialog box. 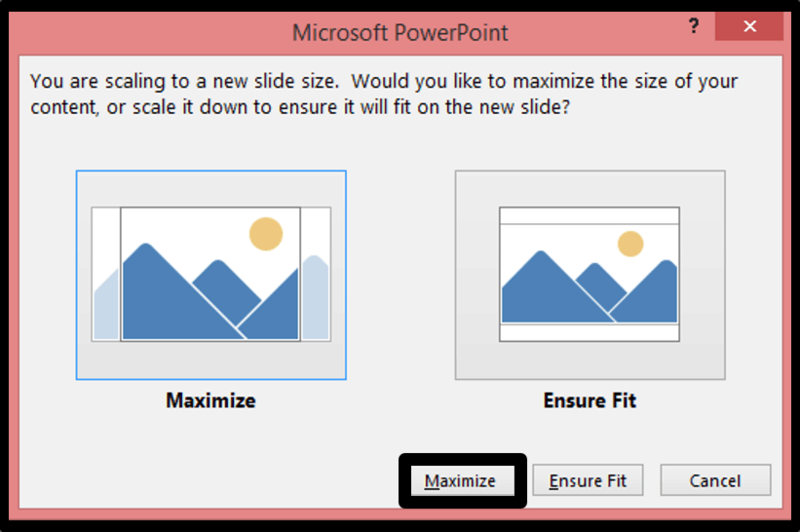 Within the dialog box, select ‘Maximize’ and your presentation will revert back to the standard slide size. What do you now have? 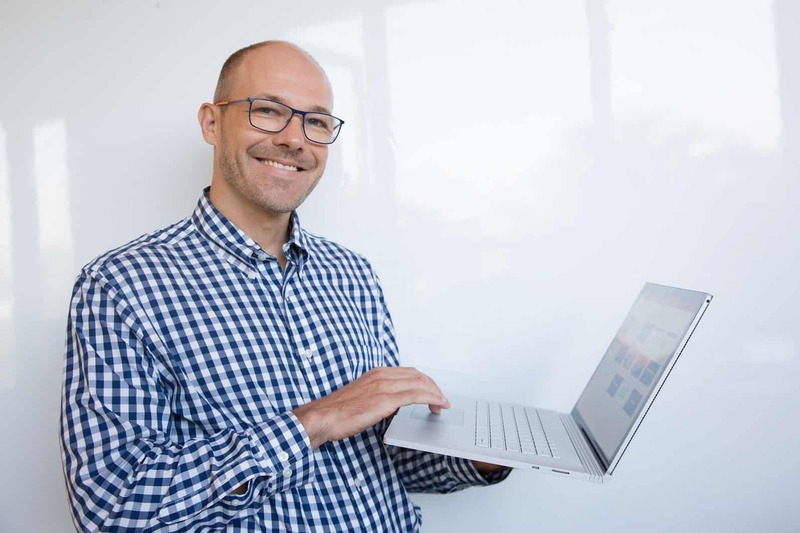 The result is that you now have a native PowerPoint presentation, with all of your slides pasted in as pictures that cannot be directly edited. Notice that if you select the slide itself, the Pictures Tools Format Tab opens. Note: Make sure you make all of your adjustments to your presentation BEFORE you export everything as pictures, like adding page numbers to your slides. Once your presentation is in this picture format, no one can edit it (including you). Any changes you want to make to your presentation, will have to be made to the original PowerPoint file, and then exported as pictures again. As a last step, make sure to save a copy of your new PowerPoint presentation. Either hit CTRL + S on your keyboard for Save, or F12 on your keyboard for Save As. 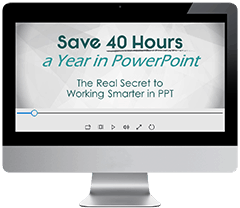 Once it’s saved, you can then safely send it to your client without worrying about losing the PowerPoint slideshow functionality OR leaving your content unprotected. This is a roundabout way to protect your presentation by turning it into a photo album. 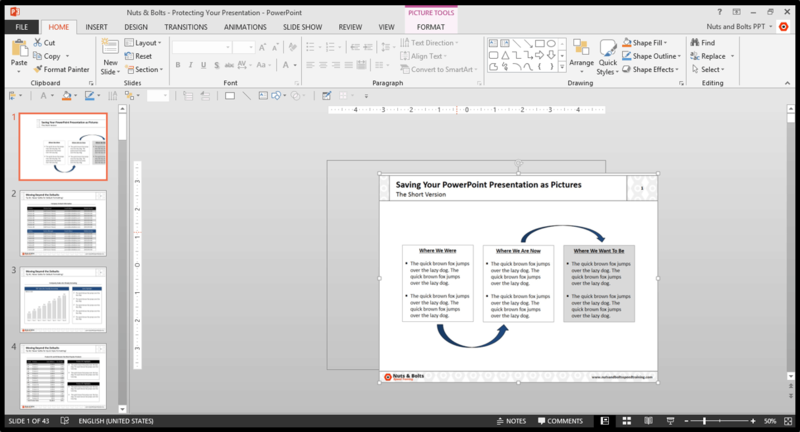 If you would prefer to password protect your presentation instead, see how to password protect PowerPoint.